Brenda O’Reilly was 20 when she arrived in Fort McMurray, Alberta. It was a memorable landing. As she stepped on the tarmac her foot slipped on black ice and she ended up, as she puts it, “on my arse.” It was the second week of January 1985. She got up, turned her head into the weather and kept going, which is something she’s been doing all her life. Brenda O’Reilly is unstoppable. Within two weeks the young woman from Torbay had a job managing Harpo’s, a small restaurant on Franklin Avenue in downtown Fort McMurray. Her previous work experience had been in catering jobs – starting at age 14 – mostly around St. John’s with Loretta Sanford, her mother Theresa and her Aunt Bea. She loved Harpo’s and liked and respected its owner, Gerry. He reminded her of her dad, Charles O’Reilly, a smart, inquisitive, self-taught man. Gerry had given her a unique opportunity and she was determined to learn as much as she could from the experience. Brenda O’Reilly thought Harpo’s was a beautiful restaurant. It was small and known for good food, serving a bit of everything including pasta. Most of the customers were Newfoundlanders. In Fort McMurray, at that time, people didn’t bother asking where you were from; they just asked, “what part of Newfoundland are you from?” Directly across the street from Harpo’s were three nightclubs. Since Harpo’s remained open well past midnight, many of its customers came from across Franklin Avenue, a wide, busy thoroughfare that cuts through the heart of Fort McMurray. Despite being in a job she loved and working with good people – Gerry, his daughter Brandy and other staff members – O’Reilly struggled with homesickness. During her first month in Fort McMurray she cried herself to sleep every night. She missed Newfoundland and thought about it often. One day she was out walking and saw something that would change her life. “It was my a-hah moment,” she says. It was a restaurant on the top floor of a small building on Signal Road, in the Thickwood subdivision of Fort McMurray. The building was situated between the Safeway Grocery and Shoppers Drug Mart. It was a country style restaurant and pub with lots of heavy wood beams and, according to O’Reilly, “a lousy menu.” None of that mattered to Brenda O’Reilly. It was the outdoor sign, high up on the building, that caught her attention. It consisted of eight letters and said, “O’Reilly’s.” In that moment she knew that one day, when the time was right, she would open her own Irish pub called, O’Reilly’s. On a night which began like every other at Harpo’s, a tense looking man walked into the restaurant. Brenda O’Reilly was on duty, busily pitching in with the rest of Harpo’s staff. The man walked up to her with one hand in his coat pocket. Suddenly, from inside the pocket he pointed a gun at her. Before he could demand cash, something came over her – she thinks adrenalin produced a feeling of uncontrollable rage – she grabbed him, screaming. “Get out! Get out!” He pulled himself away from her and fled. Police officers eventually caught the man who had held-up O’Reilly at gunpoint and given her a fright she would never forget. It turned out to be a toy weapon, but they told her she was very lucky given how things could have turned out, with her grabbing him and screaming, instead of co-operating. Brenda O’Reilly decided not to push her luck in Fort McMurray; and because she was still missing home, she moved back to Newfoundland. 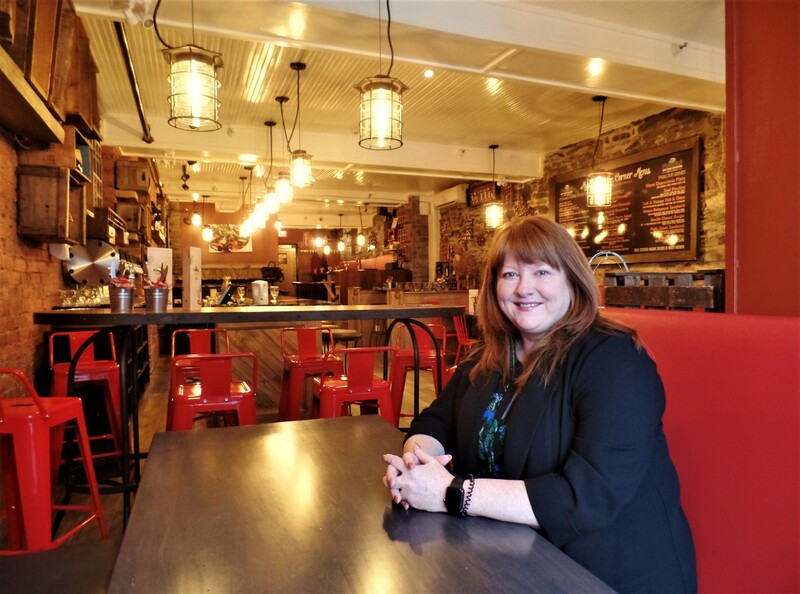 In February, on a cold, grey St. John’s morning, I sat across from Brenda O’Reilly in one of her newest restaurants, Mussels on the Corner, located in the Summers Building at 251 Water St. It had been 33 years since Harpo’s and that first job of running a restaurant. The intervening years have included triumphs and disappointments for O’Reilly. She still has the vitality of a 20-year-old, and while the years have added a few lines, her face appears youthful. It’s framed in long, fiery red hair that, coupled with her last name, leaves little doubt her heritage goes back to the land that gave us Joyce, Wilde, Murdoch, O’Brien and many other formidable storytellers. On this day, Brenda O’Reilly was a storyteller. She spoke the unvarnished story of a self-made woman. Her story. Mussels on the Corner is a beer parlour restaurant of brick, stone and brown woods, mixed with red upholstery, red stools and warm, yellow lighting. Its most remarkable feature is a large 700-pound beer delivery pipe, about a foot in diameter, that appears to come out of the brick wall behind the bar. It’s studded with a line of beer taps which dispense various stouts, ales and lagers. The weighty pipe is a decorative feature, a hollow cylinder hiding a tangle of tubing connecting spigots to unseen beer kegs. As she’s done for all her restaurants and pubs, O’Reilly designed every detail of Mussels on the Corner, including the seal fur coverings for four of the bar stools. The new restaurant is part of a small empire that O’Reilly and her husband and business partner, Craig Flynn, have built over 25 years. Their three companies, O’Reilly’s Irish Bar Inc., YellowBelly Brewery and Public House Ltd. and YYT Ltd. control an array of food and beverage outlets that together produce millions in annual revenue. In addition to Mussels on the Corner there are: O’Reilly’s Irish Newfoundland Pub, YellowBelly Brewery, YellowBelly Public House, UnderBelly Speakeasy and YellowBelly Takeaway and Hop Shop. Summer 2018 brings a new 150 seat YellowBelly Public House to St. John’s International Airport, and within two years, a microbrewery and seasonal O’Reilly’s Pub on Ferryland’s waterfront. O’Reilly says there’s another rural project in the works but it’s too soon to talk about it. Quinton trusted O’Reilly so much that she gave her signing authority and left her alone to run Casa Grande while she took an extended break from the restaurant. Over the ensuing months O’Reilly costed all the recipes and tweaked them, she maximized the space in the restaurant, supervised renovations, added tables, created a reservations system and developed an outside business selling Casa Grande’s tortillas, chimichangas, corn chips and salsa through stores such as Mary Jane’s and Auntie Crae’s. She pushed to have Casa Grande sell Corona beer and sold so much of it that Corona offered her a distributorship, which she turned down. At the Radisson her days would sometimes begin at 5 a.m. and end the following morning at 3 a.m. “I had the Cat and Fiddle rocking. I had the Blue Puttee rocking too,” said O’Reilly, adding, “We used to call it the rockin’ Blue Puttee.” The Blue Puttee was where O’Reilly’s professional connection with local musicians began. She hired piano players to perform in the lounge on weekends. Live music became as much a part of the O’Reilly formula for success as good food and drink. Fergus O’Byrne has been a professional musician in Newfoundland since 1971. He says, “Brenda hires more local, traditional musicians per year than any establishment in the province.” He also points out that O’Reilly’s work with the George Street Association has led to numerous opportunities for young musicians to perform on George Street’s Prince Edward Plaza Stage. O’Byrne met Brenda O’Reilly over 25 years ago, roughly around the time her hotel experience was ending, and she was embarking on a chapter that she would describe as a roller-coaster ride. In the early 1980s another trailblazing woman restaurateur, Kitty Drake, opened Speakeasy restaurant in downtown St. John’s. Drake and her Speakeasy partner, Penny Hansen, then opened a fine dining Newfoundland cuisine restaurant on Kenna’s Hill called, Stonehouse. Brenda O’Reilly remembers thinking that the Stonehouse was “it” and a place where she would love to work. Her opportunity came one day in 1991 when she was overseeing lunch service at the Radisson’s Cat and Fiddle Pub. A local businessman approached her who said he’d been spending time – over several weeks – at the Cat and Fiddle and had been noticing her work. He offered her a job managing a restaurant he’d purchased from Kitty Drake and company – the Stonehouse. Even though the salary was $10,000 less than she was making at the Radisson she took the job. It was a career move she felt she’d be stupid to pass up. She had wanted the job of beverage or catering manager at the Radisson, but the next opening seemed far off. O’Reilly couldn’t wait. She wanted to change the trajectory of her career sharply upward. O’Reilly began making changes at Stonehouse as soon as she could. Previous management had made it an evening only restaurant, open from Tuesday to Saturday. She remembers thinking, “You’re only open 25 hours a week and you’re wondering why you’re not making any money? It’s because you don’t have enough opportunity to make money!” After extending the restaurant’s hours of operation and opening Stonehouse for lunch she took Stonehouse from $350,000 to $700,000 in revenue in one year. It was still losing money, but it was losing a lot less. Several years later, after hiring Craig Flynn as a waiter and making him her business partner, Power-Flynn Food Management Limited would purchase the unprofitable Stonehouse business for $50,000. At the time O’Reilly was married to chartered accountant, Gerard Power. According to O’Reilly, she and Power had different career aspirations and goals. Their union was short. O’Reilly and Craig Flynn, who would become her second husband, saw eye to eye on everything. The Terra Nova Park Lodge arrangement was successful. O’Reilly was pleased but when she suggested repeating it the following summer her employer balked. Securing another Terra Nova Park Lodge contract was smart business and a job she thought Stonehouse could not afford to lose. Purchasing the Stonehouse seemed the only option. She wanted to buy the business and building, but he would only sell her the business. Brenda O’Reilly now owned the Stonehouse brand and business. “I still own the business, the name,” she told me firmly, with a hint of bitterness. “I could open it tomorrow. That brand is mine. I can do anything I want with the Stonehouse.” She has a notion to produce a series of Stonehouse cookbooks. The time may be ripe given the current taste for wild game. The Stonehouse specialized in wild game. That was its thing. When O’Reilly operated the restaurant, she filled the menu with as much Newfoundland and Labrador game as possible: partridge, rabbit, moose, Labrador caribou, seal, salmon, crab and cod. There was also muskox, alligator and rattlesnake, which she imported from a company in Detroit, Michigan. She fought for the right to buy and sell local game, spending hours talking to government ministers. “Long before the Todd Perrins of the world I was fighting for these things on my own,” she told me. During her eight years at Stonehouse, although the Kenna’s Hill restaurant was struggling, with their catering work O’Reilly and Flynn made enough money to purchase a building at 177 New Gower St. It became the satellite, Stonehouse Eatery, then Giovani’s and later Food on the Run – none lasted for very long. On December 5th, 1996 she also achieved a decade long dream. In leased premises on George Street she finally opened O’Reilly’s Irish Newfoundland Pub. In 1997 O’Reilly’s relationship with the owner of the Stonehouse building soured; the man who had originally hired her to run the restaurant. She had developed a new business plan based on the purchase of the Kenna’s Hill building. He agreed to sell her the building and a price was set, with any outstanding rent payments to be rolled into the purchase price. BDC would provide O’Reilly with financing. When the time came to seal the deal, to O’Reilly’s and Flynn’s surprise, the seller requested an extra $50,000 for the building. The deal was sunk. He wanted immediate payment of rent owed, an amount covering the period from the original verbal agreement, from May 1st to July 31st. O’Reilly says the monthly rent was high; she felt it was “too high.” He did not respond to pleas for flexibility on the purchase arrangements, nor later pleas for leeway in paying the rent. Unable to pay the large rent amount, O’Reilly reluctantly gave back the keys to the building. Cabot 500 celebrations were in full swing that summer, but Brenda O’Reilly wasn’t celebrating. She cried for four days. Staying composed and not letting on that you’re troubled by business problems has always been important to Brenda O’Reilly. Her tears were shed in private. O’Reilly’s motto is, “no one hangs out with a loser. So even if you’re not winning you don’t want to tell a soul. I don’t know why people bail so quickly.” O’Reilly’s Irish Newfoundland Pub, which had been open for less than a year, became the business on which Brenda O’Reilly focused her attention. She and Craig Flynn, together, made it so successful that today, 22 years later, it remains the heart of their overall business. Following her experience as a renter at the Stonehouse and a stressful, protracted dispute with the man from whom she leased the first O’Reilly’s Irish Newfoundland Pub location, close to Christian’s – she won two arbitrations, two court cases and lost at the Supreme Court of Newfoundland – O’Reilly believes it’s important to be a property owner. Twelve years ago, she purchased two significant properties, the building at Yellow Belly Corner and the building that for years housed O’Keefe’s Grocery on George Street. She moved O’Reilly’s Irish Newfoundland Pub into the O’Keefe’s Grocery building. Restoring the YellowBelly Brewery and Public House building, and developing a business for it, was the right project at the right time for O’Reilly and Flynn. Disputes over the leased property had taken a toll. “I had to stay positive,” she said, “so people would still believe in me, and for Craig and me not to fall apart.” Flynn loves renovating historic buildings and O’Reilly is a creator, someone who is constantly generating new ideas for restaurants and pubs. The YellowBelly project became a reviving passion for the couple. Liam McKenna became O’Reilly’s and Flynn’s brewery construction consultant, and later, YellowBelly’s brew-master. Today YellowBelly Brewery is making beer for all their properties and provincial liquor stores. In addition to the regular ales – stout, red and pale ale and a carbonated wheat ale – the brewery produces seasonal beers and special brews. YellowBelly has also produced ciders such as YellowBelly Cranberry Apple Cider. During our chat at Mussels on the Corner, O’Reilly ordered coffee for us. As soon as she’d taken a sip she said, “this coffee’s not hot.” Neither was mine. When she got a chance, she told the server and asked her to have the coffee machine checked out. I got the impression two very hot cups of java would be arriving soon. They did. When we’d finished our coffee, she took me on a quick tour of the Mussels on the Corner and O’Reilly’s Pub complex, which holds up to 700 patrons. In the rear section of Mussels, she pointed out the floor, which was covered with thousands of Canadian copper pennies. In the passageway connecting Mussels on the Corner with O’Reilly’s Pub she showed me an enormous, black, bank safe. Years ago, the Mussels space was Avalon Jewelry and the safe was used to keep gold, precious stones and diamonds. Today it’s just another Water Street relic, part of an old building’s story, on a street of old buildings with similar relics. Up a short set of steps, we entered O’Reilly’s Irish Newfoundland Pub. It was morning so only a few staff members were around. It’s a traditional pub with lots of dark wood, a prominent, large, three-sided bar, plenty of floor space and a corner stage near the George Street windows. The empty stage conjured up images and voices of local musicians who’ve performed there over the years. Later that day, like every day, more singers and players would be on that stage making music. O’Reilly asked me to follow her up a staff stairway to the next level. She climbed the stairs quickly, with determination. I was winded keeping up with her but tried hard not to look like a weakling. We breezed through the room, pausing for a few seconds as Brenda O’Reilly pointed to a booth filled corner where her office used to be. Less office space means more room for paying customers. Then it was up another short set of stairs and we were outdoors on a rooftop patio overlooking Water Street. It holds about 50 people. A long, mobile bar, with beer taps wet from a light, sloppy snowfall, was situated parallel with the outside wall of an adjacent building. We leaned over a rail to take in the long view of Water Street and a bit of the harbour beyond the Murray Premises parking lot. Turning around we could see The Rooms, another showplace for Newfoundland culture. O’Reilly had a busy day ahead of her. She had to attend the wake of a family friend, have a conference call with someone on the mainland about providing a delivery service for YellowBelly Takeaway and Hop Shop and meet with a local musician. When we said goodbye, she took a breath and headed for another set of stairs. You see, Brenda O’Reilly is unstoppable.